Extolling your might, O Lord, we humbly implore you, that, as Saint George imitated the Passion of the Lord, so he may lend us ready help in our weakness. Through our Lord Jesus Christ, your Son, who lives and reigns with you in the unity of the Holy Spirit, one God, for ever and ever. O God, who bestowed the crown of martyrdom on the Bishop Saint Adalbert, as he burned with zeal for souls, grant, we pray, by his prayers, that the obedience of the block may never fail the shepherds, nor the care of the shepherds be ever lacking to the flock. Through our Lord Jesus Christ, your Son, who lives and reigns with you in the unity of the Holy Spirit, one God, for ever and ever. Veneration of St. George comes to us from the east, probably from Palestine where he was held in high honor as a martyr. Regarded as the patron of Christian armies he is venerated under this title by the Latins as well as by the Greeks. 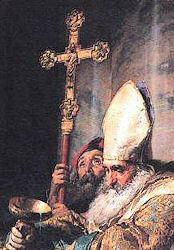 Saint Adalbert was ordained the Bishop of Prague in 983. During his episcopate he encouraged the evangelization of the Magyars. Having founded the monastery of Brevnov, he was forced into exile by the nobility of Prague. He tirelessly preached the Gospel in Poland, Hungary, Russia, and Prussia, where he was martyred at the age of 41. This optional memorial is recent to the USA liturgical calendar. In England this feast is a solemnity. When the celebration falls in the Easter Triduum, on a Sunday of Easter, or in the Easter Octave it is transferred to the next available day — generally the Monday of the Second Week of Easter. St. George is venerated by the Eastern Church among her "great martyrs" and "standard-bearers." He belonged to the Roman army, was arrested and, probably, beheaded under Diocletian, c. 304. He is the patron of England, since 800. St. George is one of the "Fourteen Holy Helpers." 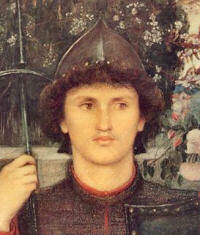 Many legends are attached to Saint George, the most famous is in The Golden Legend with the dragon. There was a dragon that lived in a lake near Silena, Libya. Not even armies could defeat this creature, and he terrorized flocks and the people. St. George was passing through and upon hearing about a princess was about to be eaten, he went to battle against the serpent, and killed it with one blow with his lance. Then with his great preaching, George converted the people. He distributed his reward to the poor, then left the area. Patron: Aragon; agricultural workers; archers; armourers; Beirut; Lebanon; Boy Scouts; butchers; Canada; Cappadocia; Catalonia; cavalry; chivalry; Constantinople; Crusaders; England; equestrians; farmers; Ferrara Italy; field hands; field workers; Genoa, Italy; Georgia; Germany; Gozo; Greece; herpes; horsemen; horses; husbandmen; Istanbul; knights; lepers; leprosy; Lithuania; Malta; Moscow; Order of the Garter; Palestine; Palestinian Christians; plague; Portugal; riders; saddle makers; saddlers; skin diseases; skin rashes; soldiers; syphilis; Teutonic Knights; Venice. Learn more about St. George including why he is mentioned with the dragon at the Catholic Encyclopedia site. This article from Britannia History gives information on St. George, the growth and influence of legends about him in England and his place in English history. Learn more about St. George and scouting. St. Adalbert while still under thirty became bishop of Prague, but the pastoral and political difficulties were such that in 990 he withdrew in desperation to Rome. Pope John XV sent him back to his diocese, where he founded the great abbey of Brevnov; but again he met with opposition to his ministry from the nobility, and again he retired to Rome. At length it became apparent that there was no hope of his working unmolested in Prague, and he was allowed to turn his attention to the heathen Prussians of Pomerania. But here he had no more success. He and his fellow missionaries nevertheless persevered in their mission, and were eventually murdered, perhaps near Konigsberg. Despite the disappointments of his career, St Adalbert of Prague seems to have had considerable influence. He was a friend of the Emperor Otto III, encouraged the evangelization of the Magyars, and inspired St Boniface of Querfurt; his cultus was widespread in central Europe. He in his turn was influenced by the ideals of the great monastery of Cluny. Patron: Bohemia, Czechoslovakia, Poland, Prussia. Symbols: Holding a two-headed cross, two lances, and a club; holding a lance with a club at the lower end; pierced by three lances and beheaded. Read this homily by John Paul II from the Catholic Culture Library about St. Adalbert. If you are interested in heraldry you may view several images here. Read about the mystery of St. Adalbert's resting place.